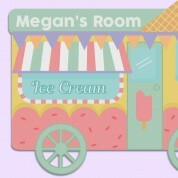 This ice cream van door plaque looks good enough to eat! 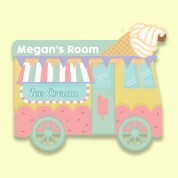 Kids will love to see this quirky little sign on their bedroom or nursery door. It features a colourful ice cream van, complete with a sliding window, sprinkles and a large 99 cone! Their name is featured in bold lettering on the truck. Our range of customised door plaques are all personalised and printed in the UK. Our team of designers produce each plaque individually, making each one truly unique. Any child will love to display the sign for years to come. 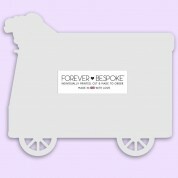 We think it makes a gift with a difference that will suit any child's special occasion - especially a birthday. They will love to learn the letters in their name whenever they look at it.